Was Terry's dismissal an over-reaction? The decision by England manager Fabio Capello to dismiss Chelsea defender John Terry as captain has shown continuity of thought from the Italian soccer boss, but is it an over-reaction? Capello has set the tone for his team by stripping John Terry of the captaincy. There are few coaches in world football who have stated so openly that selection to, and status within, his side demands performance on the pitch as well as adherence to a strict moral code away from it. 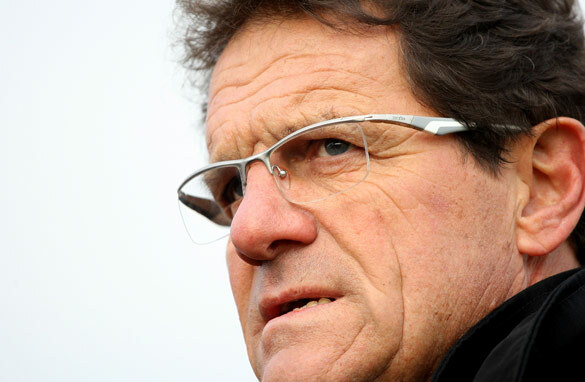 On taking over as manager of England in 2008, Capello laid down a number of rules to establish his authority - players were no longer allowed to be late for team meals, suits would replace sportswear as the clothing of choice for players before and after matches, the use of mobile phones were banned in public and wives and girlfriends (or WAGS) could no longer visit the side's hotel when preparing for a game. The transgressions of sport personalities around the world has been in the spotlight in recent times and unlike the Tiger Woods' affair, where there was no senior figure to pontificate or hand out discipline, Capello has used his power to demonstrate that a scandal-riddled private-life, proven or otherwise, is not for England. However, while the disciplinarian approach may reap dividends by the time of the World Cup, Capello may have opened a can-of-worms in using off-field conduct to determine on-field acceptability. How many careers of soccer stars down the years would have been blighted by admonishment if their lives outside of the 90-minute match had been taken into account? Who is to say that players will stand up to this scrutiny from this day forward? It is clear the Italian coach does not appreciate actions that could turn teammate against teammate, and Terry was guilty of this, but by stripping him of the skipper's armband has he created a rod for his own back? Since when are self-esteem, pride, dignity, identity, honor and respect only individually important and not for the team itself? Could call. I think a standard is being used that few left in the sports world, including managers and owners and players could meet. John Terry was selected Captain because of his on-field skills, and I have to ask, have any of the allegations surrounding his 'affair' with a team mate's ex-girlfriend affected his ability as a player, or as a leader on the field? It does not seem like it has. As far as I've been able to read both Terry and Bridges are friends. Winning games and having team spirit are your bottom line to manage Mr. Capello, not the morality of your players. The glaring problem in the wake of this decision is that the replacement is not a better role model. Rio skipped a drug test and was banned from the game for 8, and has been accused of transgressions throughout his career. In fact, one would be hard-pressed to find a player guaranteed to be in the starting XI that hasn't had an issue with conduct. As such, this decision seems to be an overreaction. Capello was quite corect to strip Terry of the Captaincy. We all kanow that players can lead pretty wild lives, but having an affair with one of your team-mates (x2) goes beyond the pale. It undermines the morale of the team weather we choose to accept it or not. the press got on to the story and really drank every bit of juice as the story unfolded live on TV while Terry tried to use the legal channels to hide the slight case of off-side play that has turned into a perminent red card off the pitch and no doubt that the un-repentent Terry has little to say in defence. this story has a parity with the rise and sexual fall of Tiger Woods and its only a matter of time before the lack of control and decency drops another, high paid star of sport into the laps of the dole queues. I don't think this is an overreaction at all, and I love John Terry as a football. If this was his first offense, and it was a random chick, i don't think it would be that big of a deal. but to do it with the partner of his teammate and best friend (altho from my understanding, Bridge and the girl were broken up at the time), that affects team moral. In addition, Terry is now under investigation for other shady dealings totally unrelated to his affair. All of these things combined will affect his play, and his leadership ability. It will also bring unwanted attention and distraction upon the team at a time that concentration and focus are necessary. TBH, I wouldnt be surprised if he's left off the squad, altho I don't think Capello will take it that far. He's still a world class defendereven if he is a crap human being. What Hypocricy !!!!! Fabio you are at least a Mediterranean !!! Has your blood stopped flowing since you went to the UK ????? What a disappointment!!! He is the captain of his team and therefore needs the trust of his team to be successful in his position. If he slept with his teammates girlfriend he should be removed since he no longer has his teammates trust. He should definitely still play for the team. Frankly this is a no-brainer; in no way can this be a 'banana peel' for Capello – any leader lacking in the self-discipline (& discretion) to do what Terry did could only be a liability and a loose cannon (who knows in what area he will slip up next) – to overlook it would have seriously eroded Capello's authority and damaged the camaraderie that is so vital for successful teams. This really is a simple business decision based on the old rule that the institution (here the team) is always greater than the individual & so that no member of the team is indispensable (ask David Beckham). Being a huge England fan and i really believe they will win the world cup this summer, the action taken by manger Fabio Cappelo were too strong and too much, a bit overrated, and he has probably made the problem worse, stripping from a job that he has held so perfectly for the last 4 years, and Terry possess the best qualities to preform as captain, and i think this decision should be thought of more throughly as it is unjust, and really over reacted, i mean it's what he does on that green pitch for 90 min that define who he is since when do we care about what happens of the pitch, that is only personal to him and his family, let him be. good call! the moral code should be applied to all avenues of life and why not start with sports! He's still playing, right? Just because he's not captain, sowhat? It;s a very minor part of the game. I heard that since he lost his armband, he asked Wayne Bridge too look under his pillow to see if it was there! John Terry's dismissal as England captain wasn't an over-reaction at all from the England manager Fabio Capello,but a progress in the history of England International football.It has now given hope to so many capable Black England players the opportunity to be at the world cup since John Terry have been on their way by having a say in whom to select that will make their team for the world cup.England has so many top scoring black players that are playing in the England premier league that are not sure of having a shirt for the world cup.Now that terry is no longer their captain,they now have hope of joining the team since terry is only on the white players side.If i may say,it's the plan from players that doesn't like Terry's Captainship to come up with this scandal in other for him to give way to them. No, it wasn't an over reaction and it's not about his private affairs/private life. More about allegedly bringing the England Captaincy into disrepute by allegedly trying to flog his Wembley Box seat and for his bad behaviour off the pitch as a Captain that demands the respect of his team mates plus all the distraction that the story will continue to generate. Capello is a very wise man to have made the decision. About time, someone knocked some sense & self discipline into some of these overpaid footballers that behave very badly. Terry's privet life should not come to the pitch, everyman man have there privet lives and there was/are many big names who had a privet lives which didn't dealt with their career. Terry is one of England's best captain, with all due respect. not at all, this is the right action.. for the squad, Terry and the public..
Terry can´t fool around with his co-players girl, it´s just not right..
And I thought that the English (or Italians) have a sense of houmor. This is only soccer, not running for the job of King of England! & I thougt that the British have a sense of humour. This is only soccer! That´s the worst kind of boss. A key player goes through the toughest time of his life and his boss leaves him hanging. Pathetic. I hope this catches up with Capello one way or the other. Such a let down. This a complete joke.He slept with the woman so what ! !.Like most married men dont do that.Capello has acted foolishly and has listened and acted to whims of the ignorant british media.Evrybody makes mistakes.Alot of very rich and powerful people have.eg T.Woods Bill Clinton.Kobe bryant etc.Terry made a childish mistake and he has certainly said he regrets what this has brought him.The Lady in this whole drama was even an EX-GIRLFRIEND of the alleged team mate (Wayne Bridge) at that time.Terry is one of the very best central defenders in the world and a damn good captain.A joke to have Ferdinand as the new captain.Every has a rat in the wardrobe somewhere. why is a player picked to be a captain? because of his ability to play football and lead the team on the pitch.why is a player sacked as captain? well it should be because he is not doing a good enough a job on the pitch. i believe peoples PRIVATE LIFE should stay PRIVATE and not be used to decide whether they make a good captain or not. can anyone please tell me why the british press always like to distroy all morale of their national sides just before a very important tournament.and why are so many people quick to judge when they themselves are no angels. As Kpek said, this is a no-brainer. Also, when you consider the gory details, the girl was the few months' old ex of his good friend and team-mate; she was also a good friend of his wife; its not surprising that he did not have the guts or the decency to resign first. When you put this against the steps taken by Tiger Woods to save his marriage, Terry falls a long way short on character. I like John Terry as a football player but I have to agree with Capello for sacking Terry. With less than 6 months left for world cup and considering how big football is in England, it would have been a media circus for 6 months if Terry would have been the captain. Terry will be captain of England team in 2012 Euro championship no doubt. Its good move to focus on lifting the world cup than having to answer media every 10 minutes. The president of the host country of the World Cup 2010 must be laughing!!! Excellent call. The team captain should be somebody that gives his teammates confidence, respect and leadership on and off the field. He does not deserve to be captain. That simple.. For the people that say the your private life has nothing to do with your game on the pitch that is simply ridiculous. You should be accounted for your actions on and off the pitch. Whatever way we look at this, he slept with his best mate and fellow professional's girlfriend. That is unacceptable for an England captain. It's one of the 10 commandments! You know international footballers don't have to be saints or role models, they just have to kick a ball better than you or me. Terry is a great player and leader on the field, and that's his job description, nothing more. So, with all due respect to the Italian stallion, you got it wrong. England without Terry as captain is no competitor in both UEFA qualfiers and World Cup in South Africa 2010. England has always been very traditional team in both moral and conduct has been above its success result or priority – not only for soccer but other games like cricket and Rugby. I am glad the present manager stood by it even though he is Italian. Well done England. Though – I wouldn't or don't agree the 2nd choice Rio as the captain – in fact, I would prefer someone else as the central defender for the current England team. Rio has been on the injury and 'out of form' and team for too long to be in first class team ! Change him before the world cup and disastrous result. Pramok, Kathmandu – Nepal. Since the immoral box was unfortunately open, u get to fix it. But don't uncover the remaining ones, otherwise, there would be no captaincy for England. tell me any footballer that is morally sound? Capello and whoever has so much to say about private conduct is the equivalent to christian Taliban, this guy should mind his own business and not what others are doing between consenting adults. enough with fundamentalism, extrmist and lesson givers. Well done, Fabio! Since you were Juventus Manager you always has underlined that a champion player is inside and outside field. Thanks! Well done , Fabio Capello, moral obligations of the standards of a modern society deserves such actions to punish those who can do what ever they want , when ever they want. Football is a respected game watched by millions of people around the world and these who play it are Icons of society. They should show us some respect by abiding to good moral standards rather than sleeping with ex-wives by cheating their own family. Why even question whether it was an over reaction? Did CNN not follow the trail of incredibility that Terry managed to create over the past few months? Now get on and focus on an even bigger disaster..namely Sepp Blatter! Forget morality. When you go behind the back of a teammate and cheat on him, you have absolutely no place to be captain of the team. Terry is fortunate to remain on the team–if he were simply a very good player, he'd be gone. He remains on the team ONLY because he is an exceptional player, even for a national team player. There are few others on the England team who would remain after undercutting a fellow teammate. People, get real. Is it moral or immoral? In a sense, who cares. It's about leadership and team spirit and respecting everyone one of your teammates enough to lead them. My scope: Capello wants to focus on footbal performance of the whole squad, no distractions (scandals in the tabloids, cell phones as ear rings, WAGS at training sites, etc.) Capello has to manage the inflated egos and paychecks to put together a "team" that can compete and possibly win a Cup. What a monstrous, complex and difficult task especially for an Italian in the UK. should be, a private matter..
Whilst I agree with Capello that discipline and respect, whether on or off the pitch is of paramount importance in sports, J.T. should be only be suspended on uncertain period especially given that the replacement captain is no angel either. I will not placed my bet on England for the 2010 World Cup. The team will become the 'also-ran' team. I don't want to sound like a prude but I am glad that someone has shown that morality and standards do still matter in the modern world. What happened to self respect and respect for others? John Terry exhibited neither in his alleged infidelity and if he cannot show respect for others how does he expect others to respect him as England captain. Fabio Capello foi correto ao tira a faixa de capitão de terry, apesar de terry ser um lider do time ele não poderia mais ser capitão, pois sua moral estar baixa. Being a captain needs alot of moral responsibility, nobody knows the reactions in the dressing room. Fabio knows better. I dont think John deserve a quit but he should reliquish his responsibilities, and apologies to his friend and all his team mates. Its a shame. Imagine a friend dating ur wife. Who cares what Capello does with his team, England will get crushed by the USA anyway! Terry's dismissal was an over reaction from my own point of view. The woman in question was already divorced to the ex husband. Legally, that shows they are no longer husband and wife and that has given each of them the right and freedom to love anyone on the planet. Will you tell me Bridge doesn't have any affair with another woman now? Did Terry force the woman in question into love affair? Infact, its just too much and honestly, over reaction for capello to have stripped John Terry the captaincy. Terry is just a determined and exemptional leader that is bound to succeed, no matter what comes his ways. I hope the action would not cause England the World Cup championship. You can see the quality of wisdom displayed by Ancelotti, the manager of Chelsea Football Club. While the need for a moral code off the field can be argued, the need to kick a guy off the team for sleeping with his teammates wife in the push for team unity should be undisputed. Would this author be cool with working at the office next to a guy who slept with his wife? Yeah, right. Well it is not John Terry faults,you capello would blame Bridge ex-wife.Base on the hatred you people have against Terry that is why you are doing this robbish.For your information Ferdinand is not whot to be England captain.No JOHN TERRY NO ENGLAND.If you are douting me just let ferdinand captain England to word cup and see what will happen.